The Chariot represents victory, success and fulfillment. It is the realization of your dreams, and a symbol of personal integration and self-overcoming. This is a period of grand success, not just because you have successfully integrated the necessary qualities of discipline, practicality and skill required to carry an enterprise to completion—and perhaps capitalized on this success—but also because the full force of your true Highest Self is finding authentic expression and actualization. This is not simply receiving a nice paycheck doing stifling, stuffy busy-work; this may be a time of proving yourself, achieving a long-worked for goal, applying yourself powerfully in the field of your vocation or calling, or receiving praise, reward or recognition for your notable service or accomplishment. It is likely rewarding in the external world, and more importantly, fulfilling to you in a deep and personal way. The Chariot symbolizes personal integration, because one who manages to harness, direct and channel his own personal powers achieves not only the dream that he is seeking to bring to reality, but also spontaneous free-flowing expression or physical manifestation of his ego. Recognition, material reward, and personal validation from others are signified by this card. In modern times, one of our main sources of personal validation is in the form of pay-checks for our product or service, and we attribute higher status to people who can afford the most expensive material objects. The Charioteer is one who has successfully materialized the goals or desires of his ego or conscious mind, and he is being applauded, rewarded and honored for seizing hold of his destiny and achieving his hearts desire. Like the Magician, the Charioteer is holding a magic wand, but rather than holding it to the sky, he keeps it calmly at his side, symbolizing that his great personal power is directed by masterful control and will. The magical sphinxes which pull the Charioteer forward to his victory do not even require reins, for the Charioteer’s power is so strong and natural, and his direction so purposeful and clear, that his auxiliaries further him in his progress with him even having to consciously direct. This symbolizes internal harmony, “flow” or ease and inspiration at work or life in general, personal fulfillment, and correspondence of inner and outer reality. The Charioteer has mastered a balance of spontaneity and control. In this card we find the happy medium between self-discipline, conscious self-direction and practical regimentation, on the one hand, and inspired intuition, emotional sensitivity and care-free imagination and creativity on the other. You cannot choke the life out of a project with rules, nor can you let intuitive fancies or weak-minded impracticality spiral you into failure. Apply yourself forcefully at this time toward your goals, with a healthy dose of courage, self-assertion, work and enthusiasm, and you will greatly enjoy the fruits of these labors. The Chariot card is ruled by the zodiac sign Cancer, which is ruled by the Moon. The Chariot card represents your will-power, determination, and victory through assertiveness. During this time, your success will be closely linked with your strong will and ability to command control, so you can feel confident and brave moving forward in unknown territory. The Chariot card also serves as a reminder to actively guide your life in the directions you desire. You can speed up with process by setting goals and pursuing them confidently. When The Chariot card is reversed, it can indicate feelings of defeat or cowardice in moving forward. You may be feeling like giving up rather than charging ahead due to feeling too self-conscious to move forward in your goals. The Chariot card can represent some opposition in the workplace. Make sure that you do not allow small issues at work get blown out of proportion or occupy your mind too much during this time. Do your very best, and do not worry about the way that others perceive you. If you are doing right, everyone will soon recognize this in your work. Act with confidence and energy, and avoid entertaining feelings of defeat. In love, The Chariot card can represent speed or rapid progression. You may find that you are tempted to go too far, too fast in relationship or you could also be feeling pressure to do so from someone else. Focus on clear, honest communications when you share your boundaries and be kind if you must turn down or slow down any relationship opportunities that are progressing too quickly. While this may be difficult in the moment, it will benefit everyone involved in the long run. The Chariot card can represent travel or transportation appearing as possibilities in your finances, so you should be open to travel or a transportation-related purchase such as a new vehicle. To prepare for future travel or purchases, you can use this time to focus on paying down any debt you have as well. 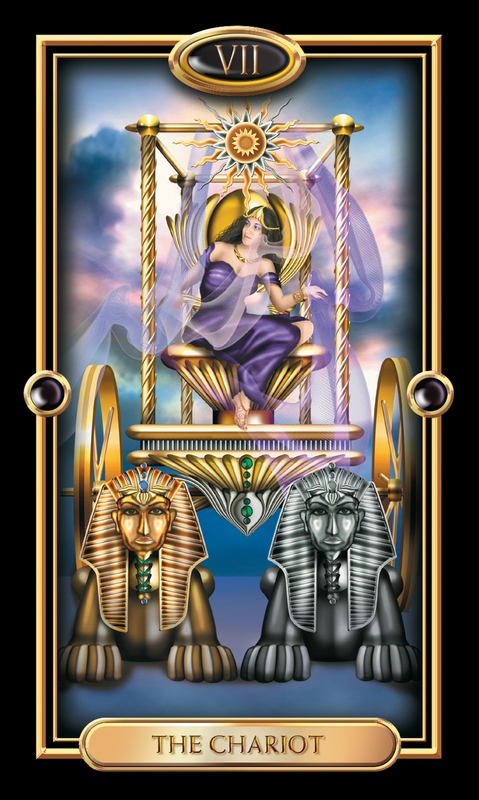 The Chariot card can also signify travel in your spirituality. Traveling to attend local spiritual seminars or group discussions may seem unfamiliar and intimidating, but will help you learn a lot of helpful information very quickly. Be brave and try new things, and this will likely be a profound time for you that will benefit you in ways you cannot yet foresee or fathom.